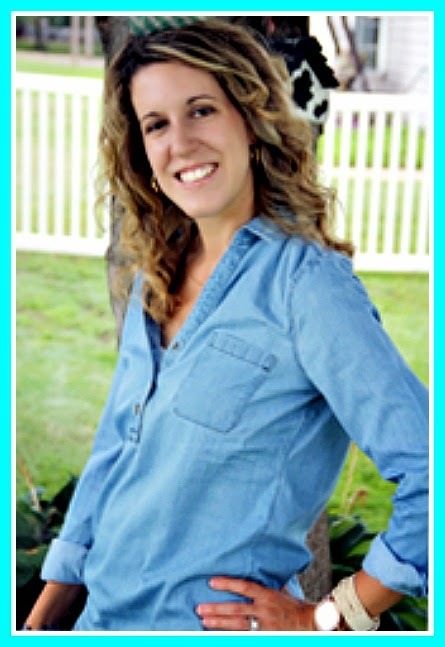 What Wives Wear Link Up – Week 8! 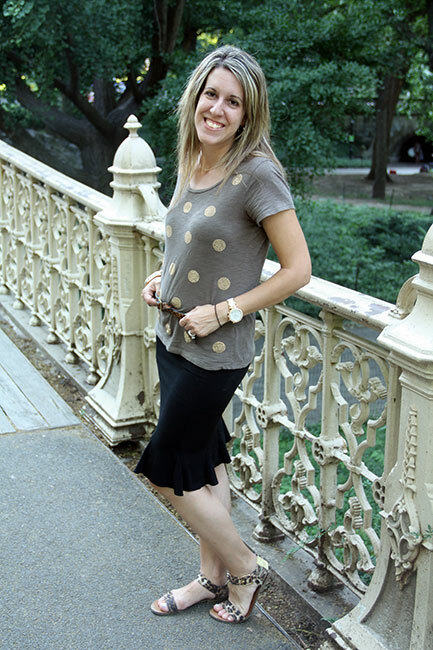 Today I am excited to share an outfit I wore in our recent trip to NYC with gold and leopard accents. Since we had planned to spend the afternoon in Central Park, I decided this would be the perfect day to wear my outfit of the week and to have (poor) Brian photograph me. I did not realize how crowded Central Park was… we have a really big park in St. Louis that is called Forest Park and I thought it was busy… but, Central Park is covered in people… so, it was a little tricky to find a secluded spot for a photo… but, we managed after walking around for a bit! So, I themed this outfit around a new pair of Mossimo sandals that I purchased from Target on clearance (click HERE for link to sandals). 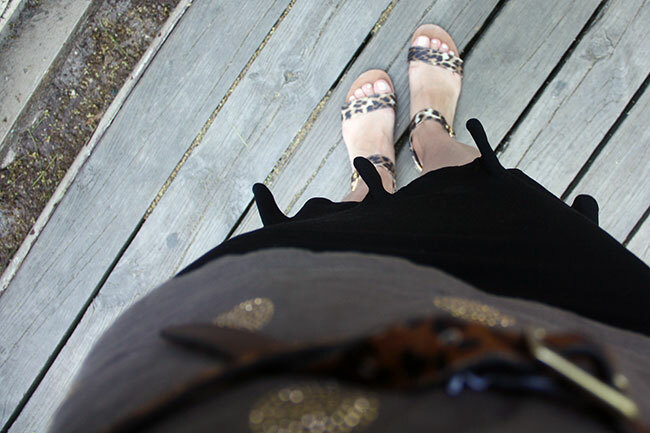 I already own a pair of leopard flats, so why stop there… I needed leopard sandals for the summer! And, don’t you love the bars of gold on the back of the sandals? It gives me a gold crush! I am also loving white polish on my toes this summer, this color is Essie in Marshmallow. These sandals are SO comfortable that I wore them for an entire day in NYC. An entire day of Chinatown, Little Italy, Central Park browsing… you walk A LOT in NYC and these sandals were comfortable and a lot more stylish than tennis shoes. 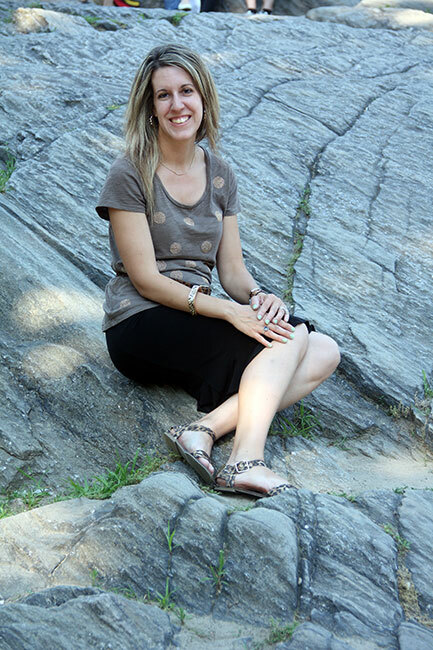 Don’t I just look comfy here sitting on this huge rock in Central Park? I love all of the natural rocks there! I decided to wear this black ruffle bottom skirt from Express and a taupe tee from The Gap Outlet with gold polka dots on it. The taupe and black went really well with the colors in the leopard sandals. I also decided to wear a skinny leopard belt (also from Target) around my shirt. It really made the outfit a lot dressier and it complimented my sandals. Brian and I have a thing with bridges, we always like to smooch when we walk under or sail under one. When we took a boat tour in Paris, we went under A LOT of bridges and did a quick kiss under each one! So, of course we found this darling little bridge in Central Park… there were a lot of bridges in the park, but this one only had a handful of people on it, so it was easier to take pictures of me on it. 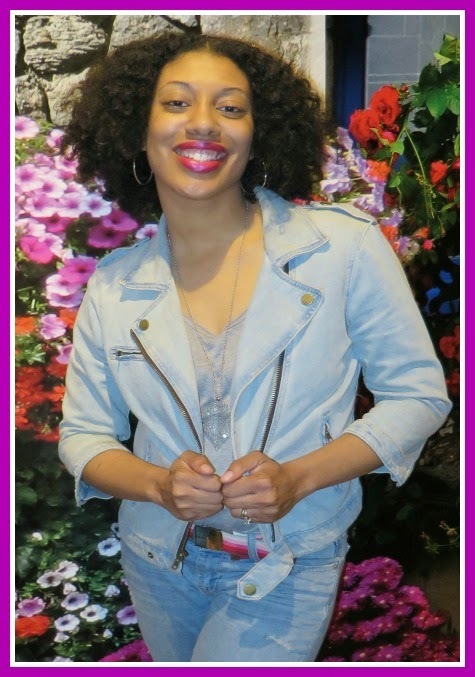 The weather was gorgeous while we were in New York and I decided to straighten my hair, since there was little to no humidity! We took these photos late in the day, sooo my hair and makeup isn’t top notch, but the park makes up for it! Central Park is gorgeous! One other accessory I wore was a leopard bracelet from Molly Suzanne (she is a blogger that owns a jewelry/clothing boutique). 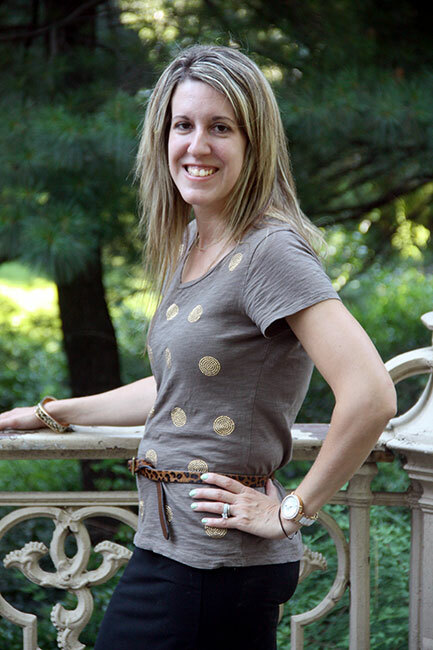 Here is a close up shot of the shirt… I love how the gold polka dots stand out from the taupe color in the shirt. I am wearing a new color of polish that I received in my Vox Surfs Up Box as well… I thought it would be fun to try it out on the trip. I have been amazed by this polish, it has not chipped yet and today is Tuesday and I painted my nails last Friday. Not sure if my manicure is lasting better, because I am on vacation… but, that is pretty darn good! You can see in this photo that the accessories really pulled this outfit together to make it a little more fun. 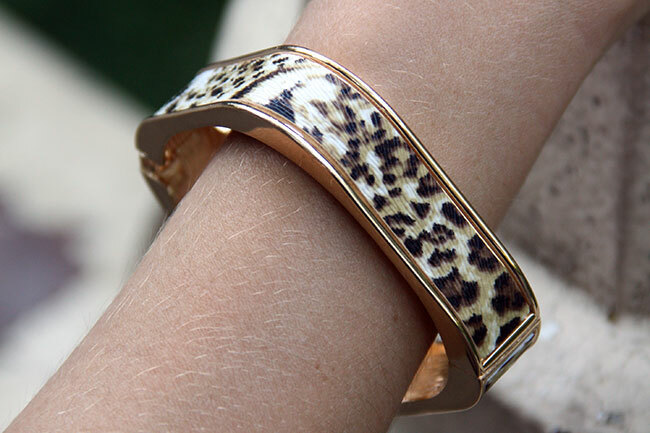 The leopard bracelet I am wearing is square, which is different from the typical round bracelet shape. to express their own personal style. Link up your favorite outfit post of the week. Get inspired while inspiring others! We will meet and link up every Thursday. 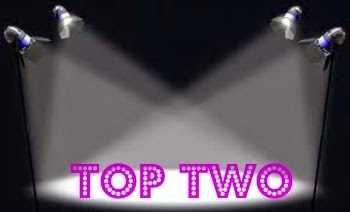 to be featured for the next weeks link up. Join us each week and we may just pick you! 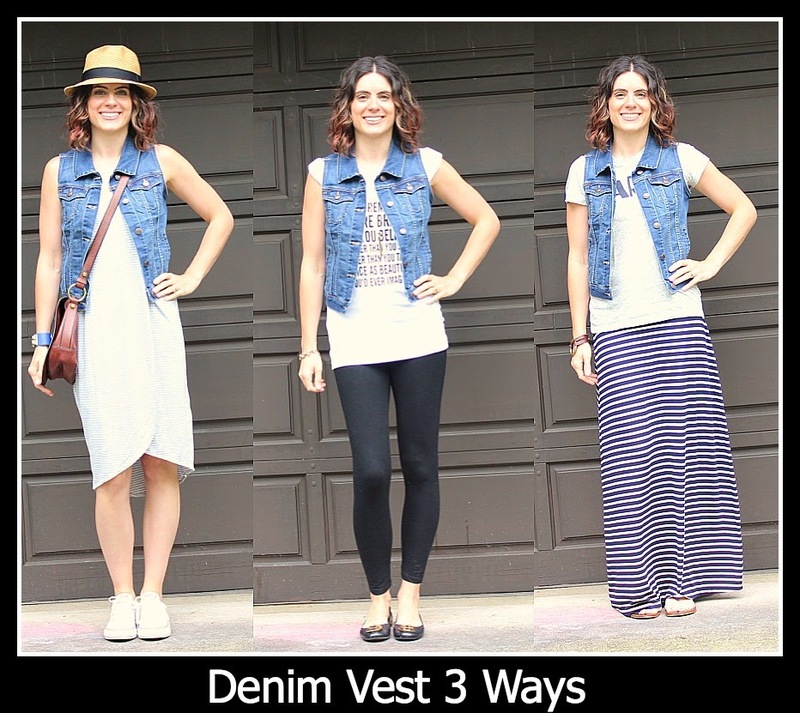 This week Agi showed us three ways to style a denim vest. All three outfits are cute & casual, and definitely mom friendly. Rachel’s floral sundress is beautiful with vibrant neon colors. A perfect look for a summer outing.